Well our backyard has finally turned into a garden. Apologies to my American friends but the word yard always smacks of something industrial - concrete, loading bays, machinery - a place where noisy work is done. The space around a house, peacefully quiet with plants, flowers, maybe a lawn or a water feature will always be a garden to me! When I was still employed, managing many acres of gardens, we also had yards, the places where our tractors and machinery were stored, where we collected rubbish for composting - very essential but not attractive or peaceful! job done - they just need to grow! 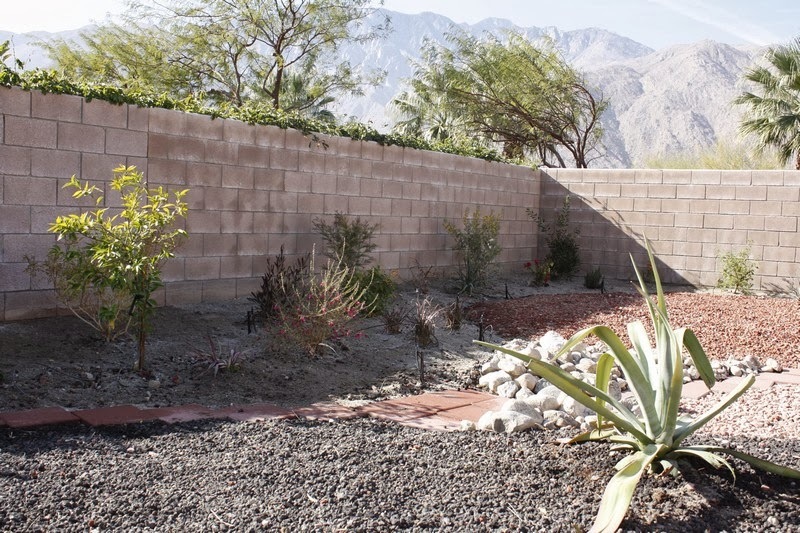 Anyway, a year after we moved into this property we now have a reasonably attractive simple design which has just been planted with many of my favourite desert tropicals. The last couple of weeks have been fun, visiting the local nurseries and sourcing the plants I wanted. Apart from a couple of elusive plants I have found exactly what I wanted and all at a very reasonable price. 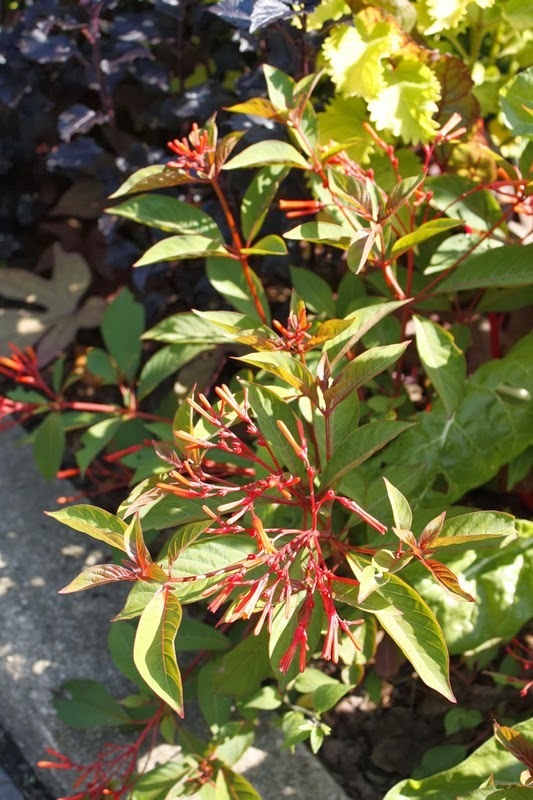 Many of the shrubs are grown in 3.5 gallon containers and cost around $15. Some are 3ft+ tall. This equates to about 13 litres and £9 in the UK. 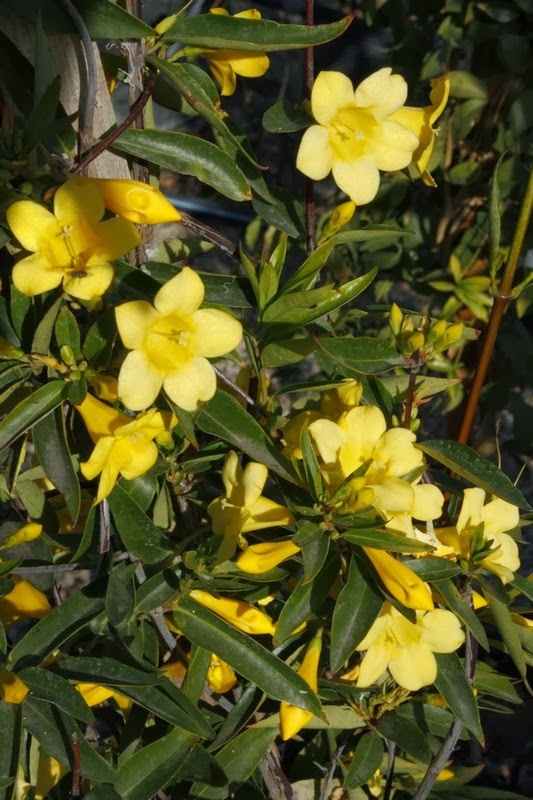 When you consider most garden centre shrubs in the UK are grown in 2 or 3 litre containers, you will see what good value they are! Installing the irrigation wasn't quite so much fun but its done, connected and the pipes buried. It works! 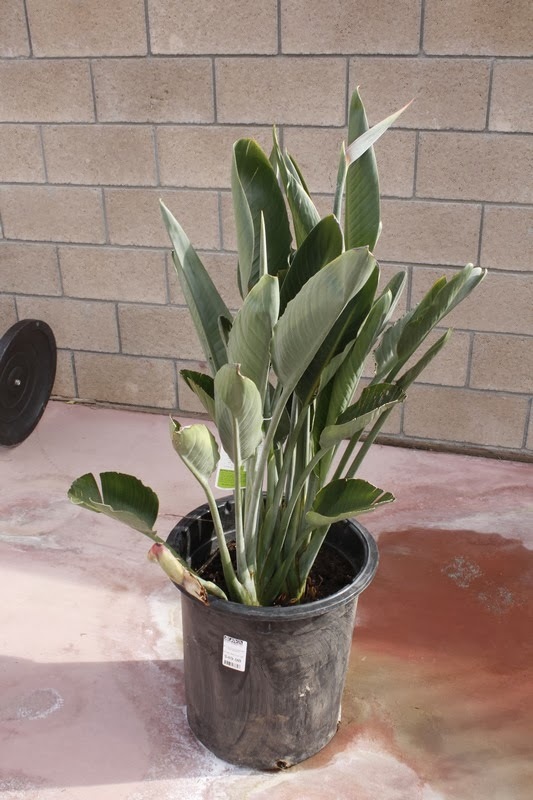 I have three different bird of paradise plants - confusing - yes! 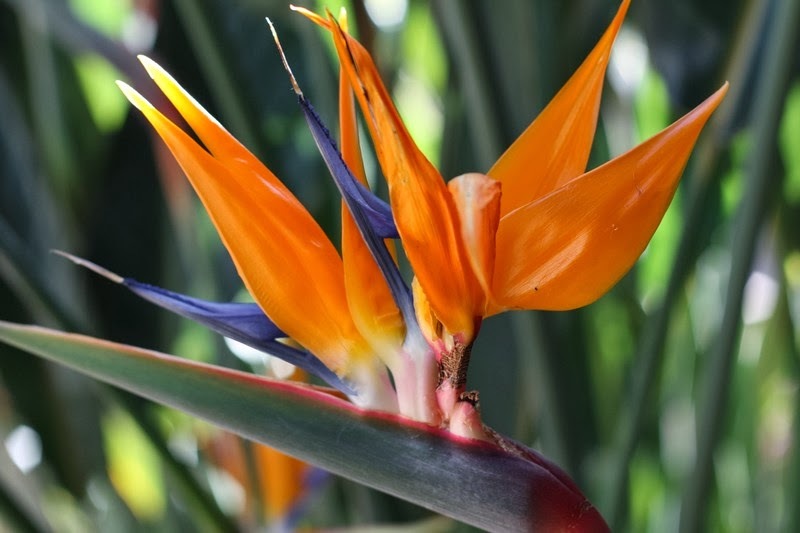 The first is Strelitzia regina, probably the most readily recognisable with its huge parrot like orange flowers. 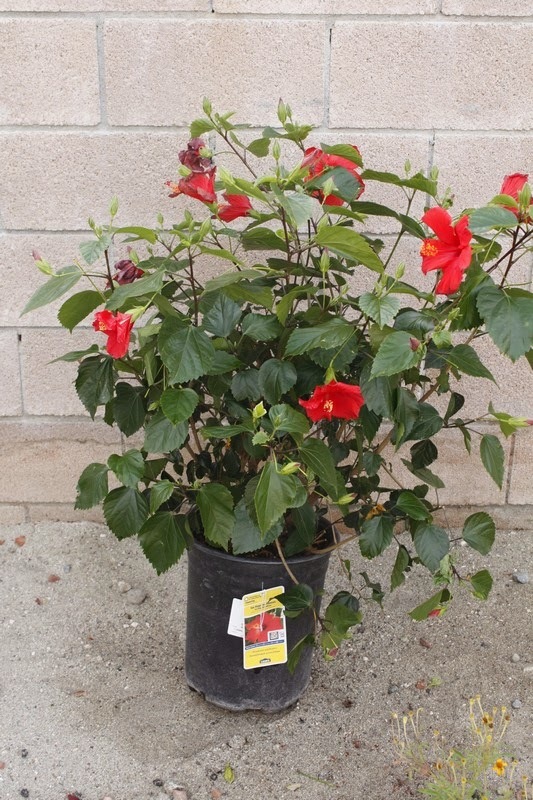 This was the most expensive at $49 but its a huge plant with three emerging flower spikes and will be potted on our patio. 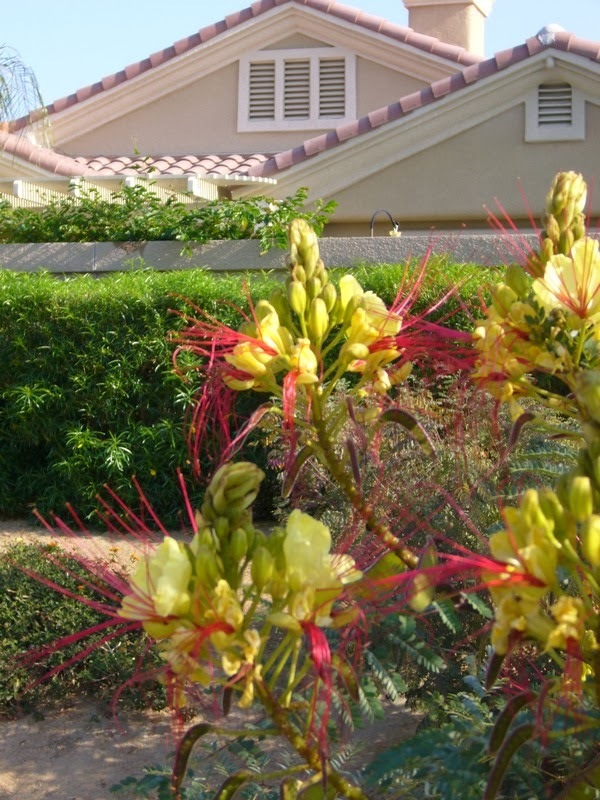 Then there is the orange Caesalpinia pulcherrima, a very common but beautiful landscape plant and the yellow flowered C. gilliesii which is less widely planted but so attractive with its long red stamens over yellow flowers. No relative to Strelitzia even if they do share a common name. 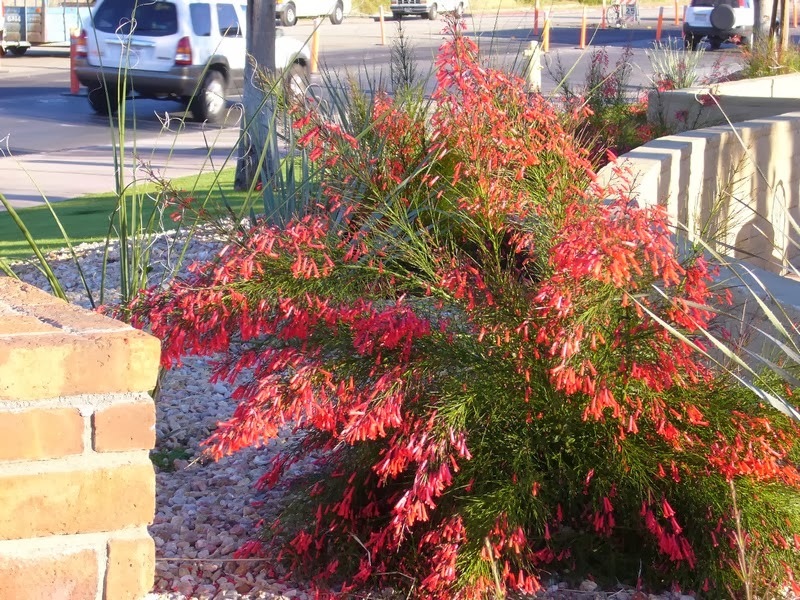 Two Australian plants that I have not grown before are Grevillea 'Red Hooks' which has lovely delicate foliage and typical spiky red Grevillea flowers. 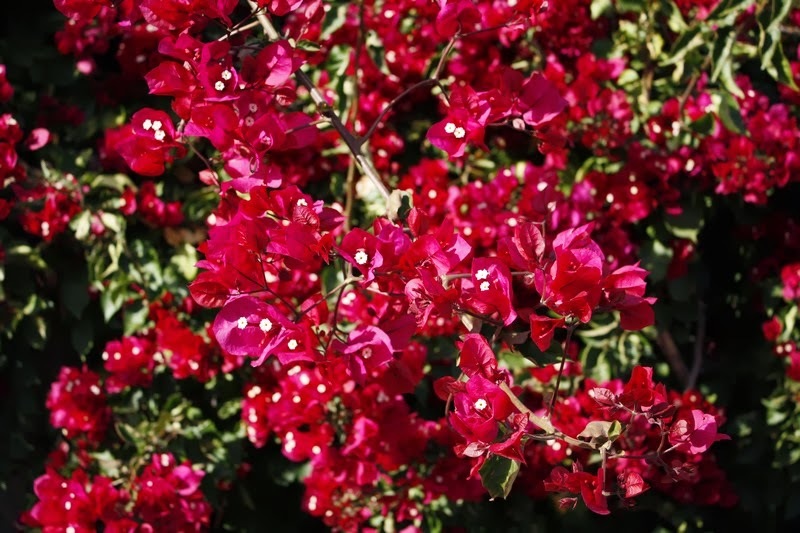 Then there is Eremophila 'Valentine' in a lovely cerise pink. 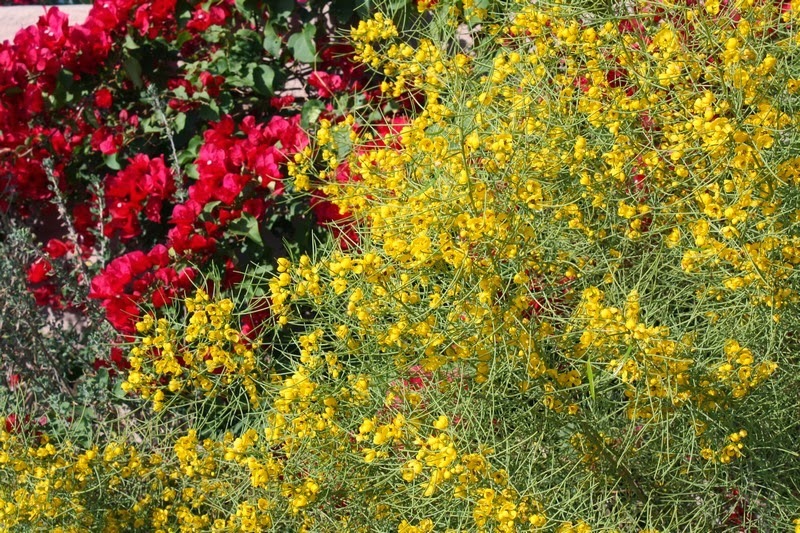 If the latter grows well I may be tempted to buy the yellow and orange forms of it. 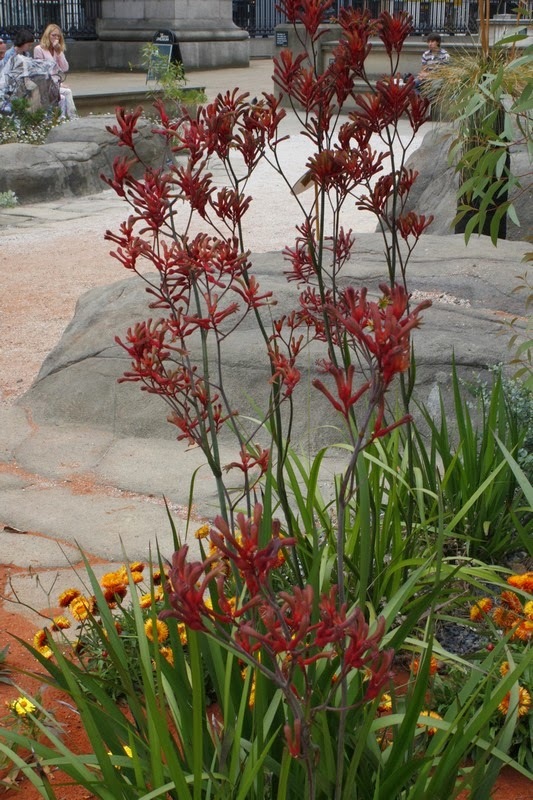 There is also a red Australian kangaroo paw. 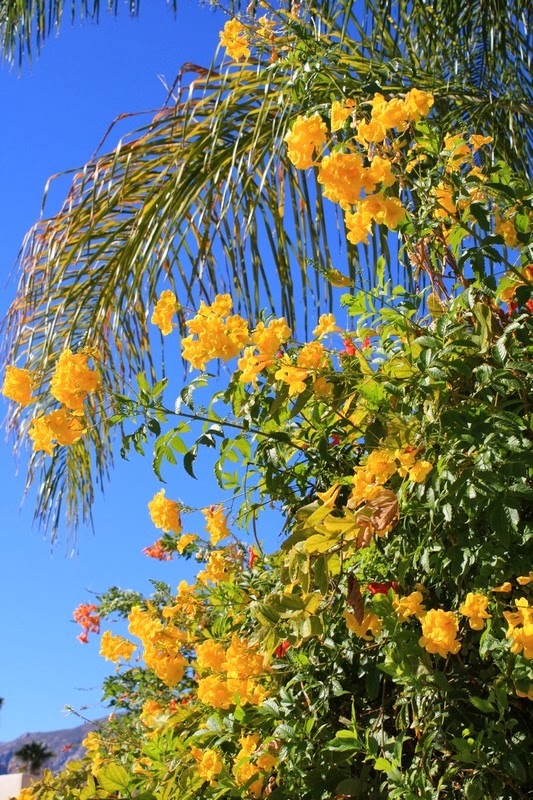 The rest are familiar sights here in the desert, Bougainvillea, Lantana, Callistemon, three species of Tecoma, a red Hibiscus, Cassia and the lovely blue Alyogyne. 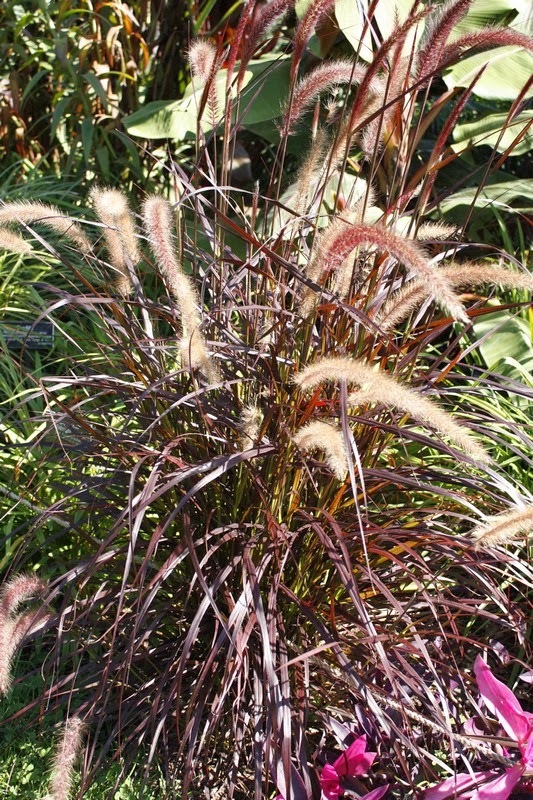 In general I have restricted the planting to species I cannot, or have not grown back home in the UK but I cannot resist purple fountain grass, Pennisetum setaceum 'Rubrum' which or course dies in the UK winter but just thrives here. The pictures below are of course not taken of the current plants but will give you an idea of what I am hoping to have in a while. 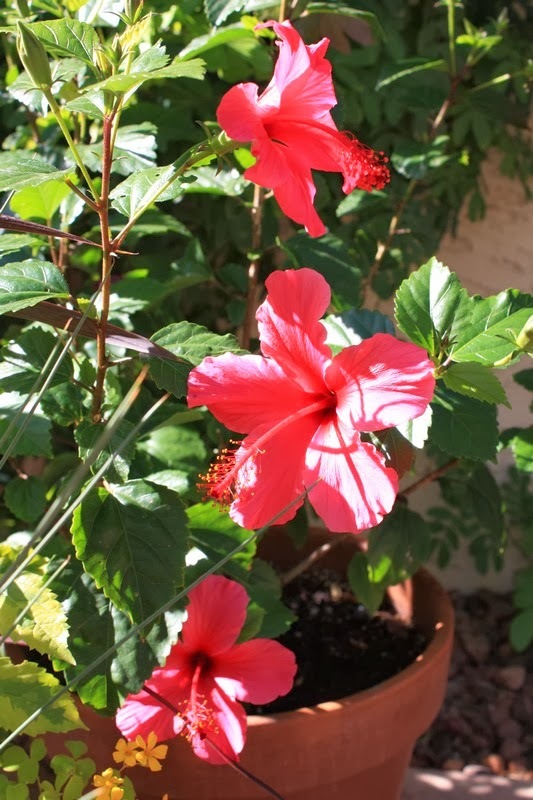 Hibiscus - hummers can't easily get at the nectar so they bore through the petals! 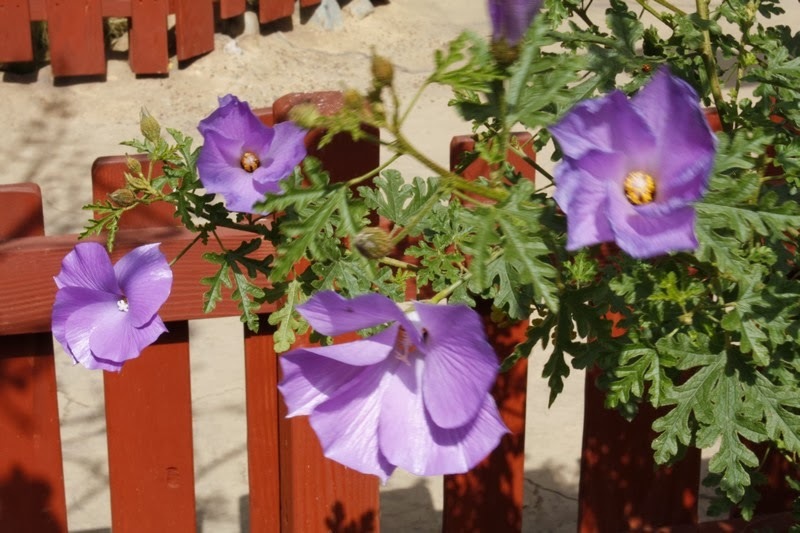 Plants grow so fast here with the heat and all essential irrigation, so hopefully it won't be too long before Philip and I and of course the humming birds can enjoy the same blooms in our little American yarden - how about that for a new word! 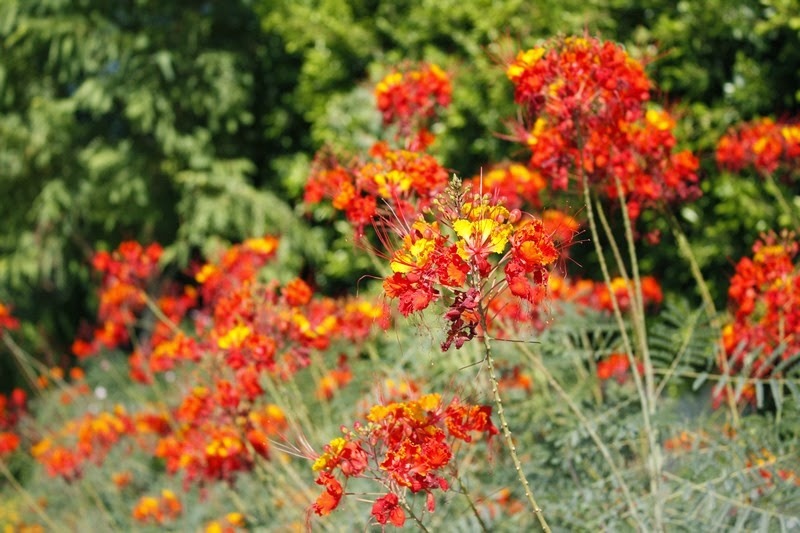 The new garden is shaping up very nicely and your list of new plants has been a visual exotic indulgence! Looking forward to seeing the progress of your new garden, as you've said the growth rate is going to be fast. Nice photos, that Russelia is amazing! 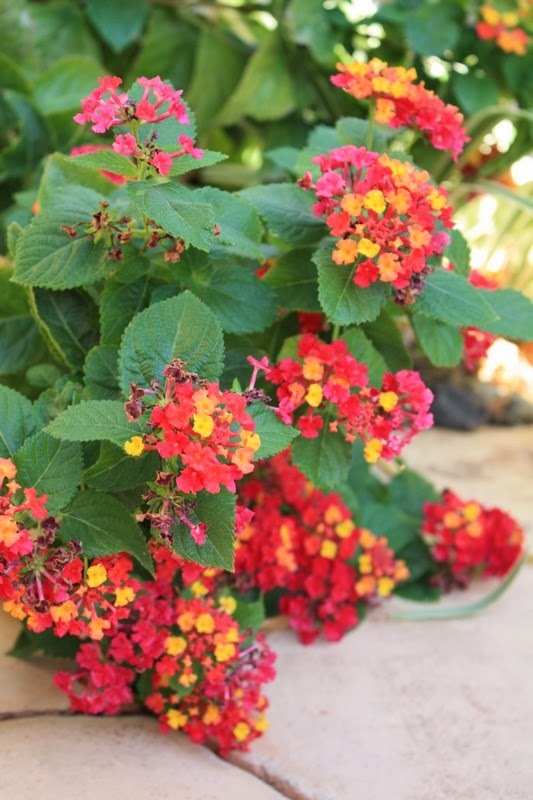 I never knew they could be so floriferous. Congrats! Looks like a nice, simple design but with plenty of interest. 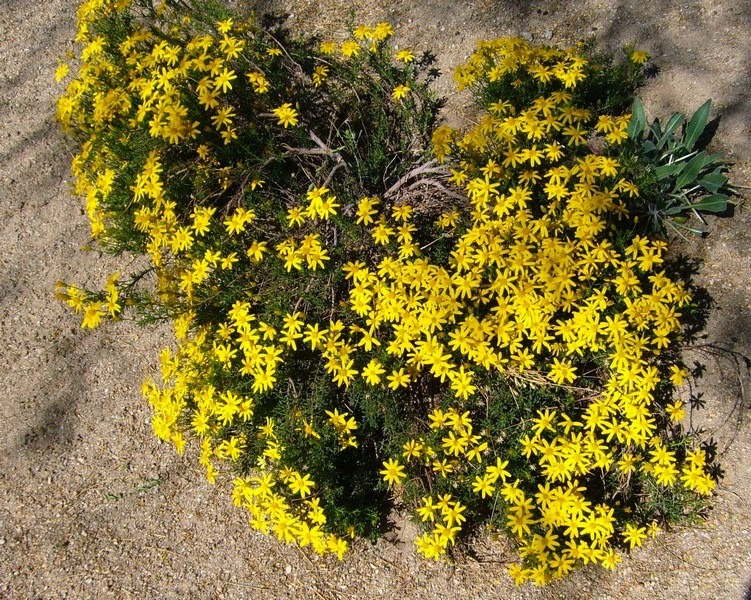 Is your photo of Mt Lemmon Marigold actually Damianita / Chrysactinia mexicana? 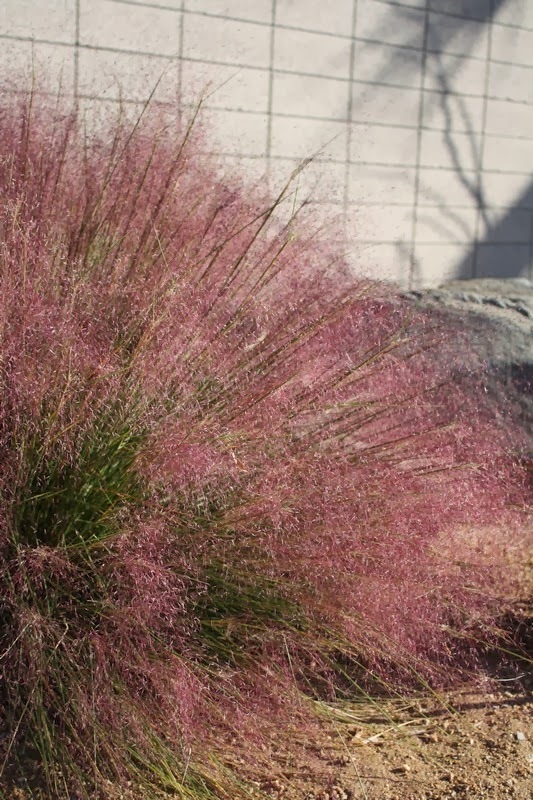 "Desert tropicals" - like that phrase the times I hear it! 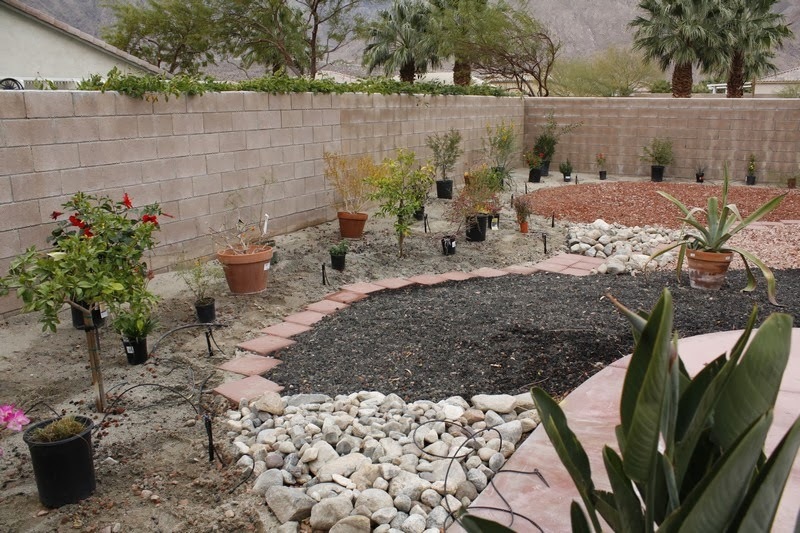 Here, we can only do "desert subtropicals", plus a few "desert temperates"...touch of winter, but less infernal summers! I'm glad for you, and jealous, not having my own property to work in the garden, even with clients who do.